Fruit and yogurt cones, or parfaits, can blow away ice creams, if done correctly. 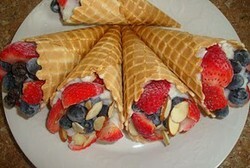 Here is a great recipe of healthy fruit and yogurt cones, which are also extremely delicious. Vanilla Yogurt. It's natural and low fat. 3-4 Waffle Ice cream Cones. Wash the strawberries and then slice it in triangular pieces. Take a waffle cone. First add some vanilla yogurt, around a spoonful. Then add some fruit, and another dollop of yogurt. Finally put a top layer of fruit. For best taste, it's recommended to have two layers of fruit and yogurt. Now it's time to put the cones in freezer. Keep them in the freezer for about 1 hour. It will ensure that they are well chilled but not frozen. Nutritional Value: 110 Calories per cone. Calories - 190 per cone. Find vanilla yogurt too plain? You can use yogurt smoothies instead of plain vanilla yogurt to suit your taste. Making yogurt smoothies are fun and easy. The first thing you will need is a quality blender which can chop ice cubes. For making smoothie first add some fruit juice in the blender. Then add almost an equal amount of vanilla yogurt, and some frozen fruits. Add some ice cubes and then blend the mixture until smooth. You can experiment with various frozen fruits and fruit juices till you get your ideal smoothie recipe. Additives like chocolate syrup, or peanut butter can make smoothies even better. Next time while planning to make some smoothies, use your ice tray to freeze fruit juices and have frozen fruit cubes at hand. The texture of the smoothie will be even better. Are you a diet junkie? You can alter the ingredients a bit and have your own diet smoothies. Sunflower seeds and banana are excellent additives for diet type smoothies. Use non fat yogurt instead of regular ones. And for fruits, use apple juice, blueberries. To increase nutritional value, you can add additives like protein powder and bee pollen in your smoothie. Note: Keep in mind though that your smoothie should not have a very strong flavour. The cones are best enjoyed with plain vanilla yogurt or smoothies with a subtle flavour, otherwise, strong flavours overwhelm the natural taste of fruits. If you liked the recipe, please share it on Facebook and Pinterest. You said if you like the recipe to share it on pinterest. I couldn't find a pin it button anywhere and my computer won't let me install a pin it button. So, it would be helpful to have a way on here to pin it. @katiem2 - Glad that you like it. What a delicious looking and sounding treat. Sounds delightful and with summer heading our way a wonderful addition to a healthy diet.